For those who haven’t ever watched it, Release The Hounds is a television game show that’s a real-life cross between a Saw movie and the Crystal Maze. Teams of three friends (usually muscle-bound Essex lads) are dropped into a remote forest location, and must face a series of horror challenges in order to earn money. As if being put through harrowing, scary puzzles wasn’t enough, in order to bank and take home their winnings each member of the team must face an individual dog run. And yes, that is exactly what it sounds like, as the runner must escape the forest with only a short head-start over a pack of hungry dogs. This is actually a really original idea for a game show, and despite the occasional cheesiness of the presentation – and the fact that the “scary” show is hosted by the ever-grinning Reggie Yates – Release The Hounds is an entertaining bit of throwaway television. With its combination of riddles and puzzle scenarios and athletic sprints away from pursuing canines, there is definitely fodder there for a video game adaptation. It’s a shame then, that the resulting title is simply a poorly-executed Temple Run clone. All semblance of puzzling or passing challenges in order to earn your prize is thrown aside, and the title consists solely of endless running. The Saw-like suspense and riddles – the most interesting aspects of the TV show – are ignored entirely. 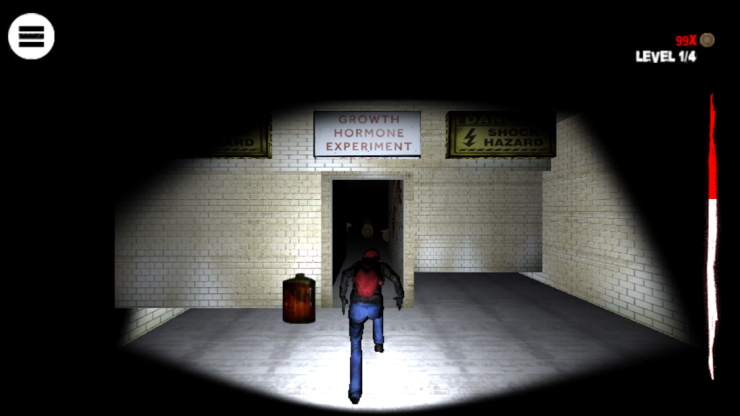 There are five locations to play through, such as the Asylum and Scarecrow Fields, which are all supposed to reflect the spooky atmosphere of the show. All of these levels are simply straight runs, with objects such as fallen trees to jump over or open doors to dodge, whilst trying to pick up as many coins as you can. You can buy upgrades such as a flashlight to temporarily illuminate more of the screen, or sneakers for faster running, and although in-app purchases are available, this can all be purchased for free with repeat play. The levels sadly aren’t scary in any way, and the only interesting idea is that each level is dark and you can only see a few feet in front of you. This obviously makes judging your jumps and dodges more challenging, as you try to collect enough money to take the dog run and bank enough cash to unlock the next stage – but it definitely doesn’t make it more enjoyable. The character model is a gangly, badly animated mess and the rest of the low quality visuals suffer terribly from pixellation. None of the levels are particularly detailed or fleshed out, so the design choice seems entirely deliberate, relying on the lack of light to hide a multitude of sins. Other than the poor graphics, and incredibly basic sound effects, the game suffers from unresponsive controls and slowdown. Of course, touch gestures are employed for movement, but jumping is very laggy and you have to make sure you swipe to leap much earlier than you imagine is necessary. Even then, poor collision detection means that when it appears on-screen that you are clear of an obstacle, it still hits you – and when you successfully clear an obstacle, your character passes straight through it. This makes it easy to lose energy accidentally, and the less energy you have, the slower you run – which makes winning your dog run almost impossible. Release The Hounds simply wastes all the strengths of the television series in an attempt to shoe-horn the game into the Temple Run template. Even then, the result isn’t a fun or well-made clone, but a glitchy, irritating experience that looks like it was made years ago. Thankfully it won’t try to gouge you for you own real-world money at every turn like some mobile titles do, but it is unlikely that anyone will bother playing it long enough to warrant buying upgrades anyway. Release The Hounds has managed to make a real dog’s dinner out of an interesting premise. The Hounds should be set loose on this game, as it has no real redeeming features.